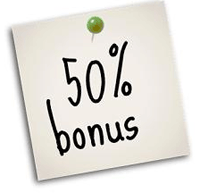 We’re running a promotion where you can receive 50% bonus instant credits, just a couple days left. It’s the middle of the ski season here in Utah and I like to maximize my time on the mountain. I was just checking out the weather and we’re going to get 8-10 inches tomorrow. Yeehaaa! But sadly, business doesn’t take a break for snow days. So we still need to keep things moving forward, keep connecting with new leads and bringing in new sales. Which is exactly why we built SocialAdr in the first place. Because we wanted a tool that was going to work for us even when we weren’t working. And that’s exactly what it does. Set it and forget it, as they say. Are you leveraging that kind of automation in your business? Use this to save some time while getting a bunch of social promotion for your website. And then go out and do something fun! Hooray, it’s Cyber Monday. That means it’s time for all us tech types to trot out our best deals. And this will be no exception. We run a special on instant credits on a pretty regular basis. It’s usually roughly the same deal. But today, we can’t just do the same old deal. We have to ramp it up. So, when you HURRY and take advantage of Cyber Monday, you can get a deal that’s almost 50% better than our usual offer. For a very limited time you can grab 70% bonus creditson almost all our instant credit packages. What will you do with those credits? You could install our brand new WordPress plugin and use the credits to promote your blog posts that are automatically added to SocialAdr. Or you could grab one of our new Facebook Likes campaigns. Or you could always use it for that core level of social promotion that has been our bread and butter. Whatever you need them for, this is the best time to stock up, because you won’t see this deal again anytime soon. Get 50% bonus credits, ailment now until midnight on Aug 31!